5/4 Cup of Coffee: The system's two most advanced affiliates won narrowly on Friday thanks to strong pitching and clutch hitting. Meanwhile, the two Single-A affiliates surrendered 21 total runs in two losses. Right-handed pitcher Allen Webster built on his strong first month of the season in his first May appearance Friday by tossing six innings of two-hit ball in Pawtucket's 4-1 victory over the Durham Bulls (TB). In his second start since making his major league debut on April 21, Webster, 23, continues to show why some believe it won't be long before he's back contributing at the big league level. Picking up his first win for the PawSox, Webster racked up nine strikeouts, giving him 26 in 20 innings pitched. Offensively the club was led by another recently demoted player, catcher Ryan Lavarnway. Lavarnway, who hit cleanup, picked up three RBI in the game, two of which came on third-inning blast over the left field fence. While not one PawSox player registered multiple hits, center fielder Justin Henry, who hit third and accumulated three walks, was the only other player besides Lavarnway to reach base multiple times in the game. The Eastern League-leading Portland SeaDogs extended their winning streak to six games in dubious fashion Friday as their 5-4 walk off win over the New Britain Rock Cats (MIN) was made possible by a two-out ninth inning error. Trailing 4-3 heading into the bottom of the ninth with the seventh hitter due up, the SeaDogs, thanks to a walk and an infield single, were able to stay alive long enough to put a bat in the hands of top prospect Xander Bogaerts. Bogaerts popped the 2-2 offering into shallow center field, effectively ending the SeaDogs' chance at a late-inning rally, or so it would seem. The Rock Cats center fielder dropped the routine pop-up, plating two for the SeaDogs in one of the more bizarre walk-off wins this season. In addition to being the late-inning hero, of sorts, Bogaerts collected his second home run of the season on a solo shot in the first inning. Designated hitter Matt Spring, who walked in the ninth inning, also went deep, his first of the season. SeaDogs starter Drake Britton was not sharp in six innings, surrendering seven hits, three walks and four earned runs. Britton's ERA on the season now stands at 4.75. Working in relief of Britton and picking up the win was right-hander Chris Martin, his second win of the season. The Salem Red Sox were routed by the Winston-Salem Dash (CHW), 10-1, on Friday. Among the few bright spots for Salem was left fielder Brandon Jacobs, who picked up his second home run of the season, and the team's only offensive of the game, on a solo shot in the fifth. Third baseman Garin Cecchini, who leads the Carolina League in hitting, extended his hitting streak to nine games with a single in the sixth, while leadoff man and designated hitter Matty Johnson collected two hits for Salem. Starter William Cuevas dug the team into an early hole by giving up eight hits and seven runs (six earned) in three-plus innings of work. Heri Quevedo, who relieved Cuevas in the fourth inning after he gave up three runs without recording an out, gave up three more runs (two earned) in his 4 1/3 innings of relief. The Drive's bullpen spoiled a strong performance from starting pitcher Brian Johnson by blowing an early 4-0 lead in Friday's 11-4 loss to the Rome Braves (ATL). Johnson, the 31st overall selection in the 2012 draft, gave up only two hits and one walk in five strong innings of work. When the 22-year-old left-hander exited the game, he had amassed six strikeouts and left his bullpen with a four-run lead. Some rough relief appearances by Austin Maddox and Austin Younginer, who combined to give up 10 runs in 2 2/3 innings, cost Johnson, and the Drive, the win. At the dish, cleanup hitter and designated hitter David Chester belted his fourth home run of the season, a solo shot in the fifth. First baseman Kevin Mager, who made his debut with the team on April 29, went 2 for 3 in the game with a walk and a run scored. 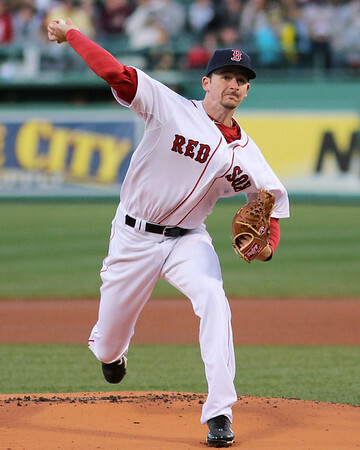 Player of the Day: PawSox right-hander Allen Webster carried over his successes from the spring and month of April into his first appearance in May by punching out nine in a win over the Durham Bulls. In four starts in Triple-A, Webster has 26 strikeouts against six walks, with opposing batters hitting only .171 against him.